Manuka Range/West Stour area • By lewshaw. Licence: C.
To minimise the road walk, Woolshed Creek can be accessed via the Burma Rd. This makes the road walk only 1.4 km. It took us 2 hours to get to the hut this way in the dark. To reach the Stour Valley from the hut, walk up the Burma Rd (4WD track uphill of hut) to the fence-line and follow the fence-line initially down an open spur. Veer off to the left at the foot to avoid a swampy approach to a deep creek. Manuka Hut • By Matthew. Licence: C.
If you wish, you can check out a rapidly deteriorating musterers' hut surrounded by lush green grass near the junction of the West and East Branches of the Stour. This hut is visible from the Burma Rd fence-line. It is about 100 years old, constructed of tongue and groove and clad in corrugated iron. Unfortunately the roof has blown away in recent years. The floor is earthen with watercress now growing there but the chimney, though on a lean, is functional. The bunks are long gone. There are now minimal legible pencil records but on a former visit, I recall there were lists of musters indicating the age of the hut. Cross 2 stony stream beds and ascend to the ManukaRange. The whole route is very open and easy until the descent to the now visible Manuka hut from the tiny saddle directly above it. Fortunately there is a small scree just past the hut which means you can avoid a line of matagouri flanking the terrace on which the hut sits. BTW the location of Manuka Hut is wrongly marked on DoC's list of huts on GoogleEarth. It is on the true left in a pleasant sunny setting. 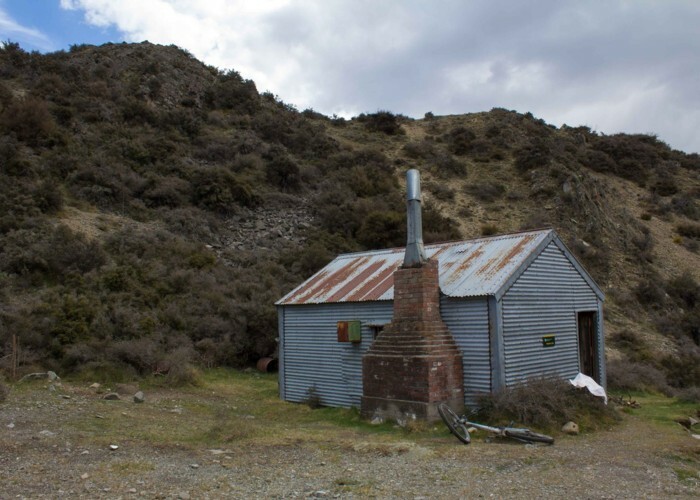 From Woolshed Ck Hut to Manuka Hut it took us around 5 hours with a lunch break with great views of the Mt Somers, Two Thumb and Arrowsmith and Dog ranges just short of Pt 1083 lee to the NW wind. From Manuka Hut, follow the fading 4WD track to the DoC signs via red polypropylene sleeved waratahs. 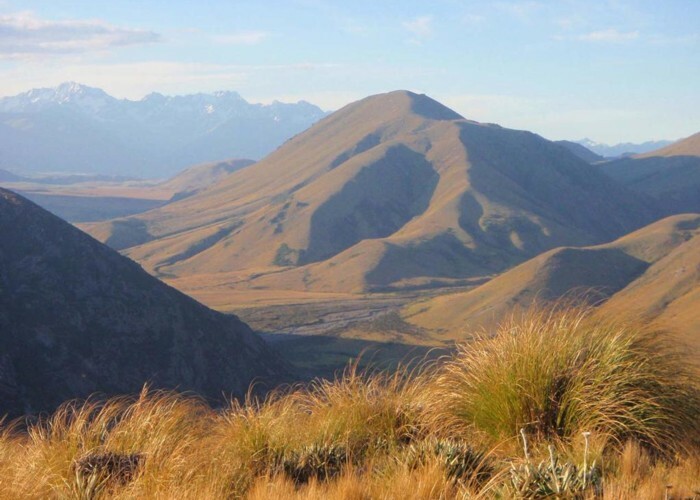 You are now on the Te Araroa trail that heads downstream to the junction of the East and West Branches of the Stour. Approximately 2 km upstream of this junction there is a high river level route that means you can avoid crossing the co-joined 2 branches. This 4WD track skirts the southern border of a swamp and crosses a low saddle (700m asl) between 2 hillocks of rhyolite origin. The 4WD track then goes down the StourRiver gorge to Blue Duck Creek where an easement passes through private land (Barossa Station) for about a km. A possum plucker had been successful here, leaving several naked carcasses for raptors to dine on. The track terminates in a section of crown land set aside for soil conservation and river control. The newly bulldozed track runs through infestations of sycamore, pine, rowan and other weeds species. DoC have inherited a massive hay shelter which now serves as a changing shed/shelter with a thoughtfully provided bench. The 17km walk from Manuka Hut to the Stour River car park took us just over 3 hours in a drizzly head wind with a diversion to gather watercress from the derelict hut. Added 25 April 2011 by HonoraHonora. 2 revisions, most recently 28 April 2011 by HonoraHonora.